I got a call from Netvigator within couple of hours from a sales who couldn't convince me why as an existing customer I have to pay more keeping the broadband at home while going mobile. Are there many people out there connecting full time via fixed line at home while taking their notebook outdoor surfing at the same time? To illustrate, say I'm paying $198 for my home broadband but it isn't used while I'm away, Netvigator knows that don't they because they must have utilization records in their database. They could apply that diversity and oversell can't they? 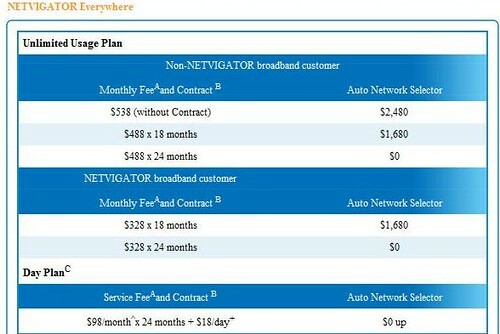 If I go for their 'Everywhere' plan I have to commit to a 18 months contract at $328 per month which equals to $526/month plus costs of $1,680 for the USB 'auto network selector'. If you are new customer, for exactly the same thing, you only need to pay $488 for a 18 months commitment and $488 for 24 months and the dongle is free. Vodafone isn't very good either so far I have no phone call or email contact from them. [edited] they did come back about 24 hours later forwarding their standard ads without any human touch.